Last week I served raw chicken to friends who came for dinner. Yes, you read that right: Raw Chicken. Even though I thought I’d timed things perfectly so it would come out of the oven fifteen minutes after our guests arrived, for some reason that mystery bird just wouldn’t cook. By 7:45, it became obvious their two year old boy was starving, so in desperation, I served the soup. Then I got up to get that chicken out of the oven and carve it no matter what. If you’ve ever attempted to cut undercooked poultry, you know how I slaved. Not only was the 4 pound bird still partly raw, it also yielded a miserable quantity of meat, which I took out to my guests after keeping them waiting ten minutes. I couldn’t tell if I was sweating from battling with the bird in a hot kitchen or from embarrassment. But you know what? We still had a great time. A small plate of undercooked chicken couldn’t ruin the laughter and conversation. Our friends brought us a large bouquet of beautiful flowers, which I divided into four vases the next day. The flowers were abundant even if the chicken was scarce. My daughter’s words reminded me I had a choice. Would I choose to remember the scarcity of that pitiful chicken? Or would I smile over the joy of new friendships, shared hearts, laughter, and all those beautiful flowers I still had the next day? So often I replay shortage, lack, and insufficiency in my mind. Yet in reality, God has blessed me with abundance and more than enough provision. His resources and power are limitless. I don’t have enough time or energy. I don’t have enough patience to deal with these kids. Our living room furniture is falling apart. 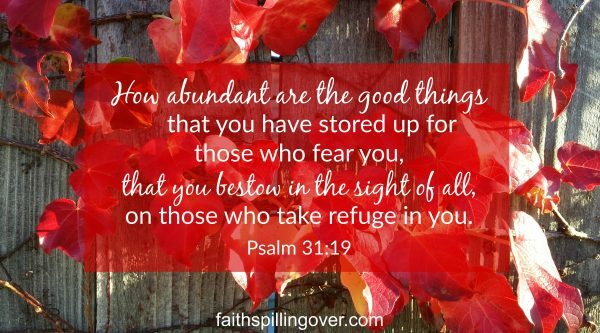 What if we chose instead to rehearse in our minds truth about God’s abundance from His Word? What if we spent our energy reminding ourselves of God’s generosity instead of etching our lack more deeply into our brains? Each time we affirm God’s abundance, we move one step closer to believing we have enough. God has given me the gift of 24 hours today. I have enough time to do everything He calls me to. I’m not falling behind. I’m simply learning to follow God’s timeline for me. God’s grace is sufficient for today. I may feel like I’m hanging on by a thread, or like my kids are one step away from driving me crazy, but God will empower me with grace, joy, and strength for today. I don’t have to look further than Jesus Christ’s death on the cross to know that I’m deeply loved. So I’m free to love others because God already loves me abundantly, not because I’m hungry for them to love me in return. Friend, I’m not sure what lack you’re facing today, but may I remind you that in Christ, we have more than enough of everything we need? Even when our feelings try to tell us differently. Will you pray with me? Lord, forgive me for my scarcity mindset. Open my eyes to your abundant provision of everything I need. 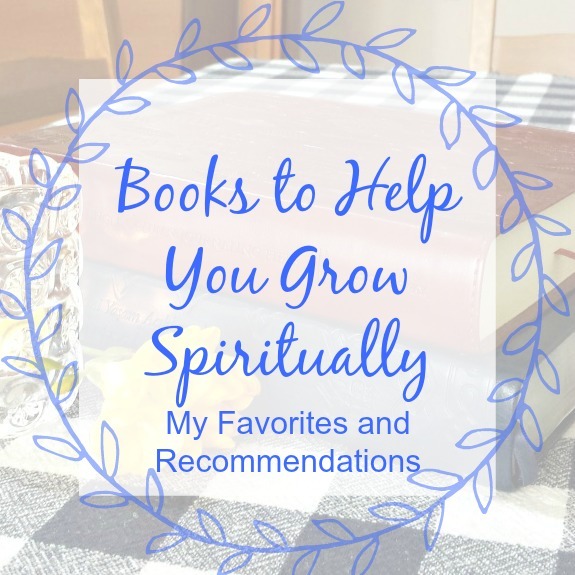 Linking up with Kelly Balarie’s #RaRaLinkup, Holley Gerth’s Coffee for your Heart, Crystal Storms’ #HeartEncouragement, Salt and Light with Alisa Nicaud, Lyli Dunbar’s #FaithonFire, and Arabah Joy’s Grace and Truth. Check out these communities for more encouragement. Hah! And I love you, Brittney! Your visit was the highlight of our week! Especially Alonzo! Betsy, thank you for this gentle reminder. Scarcity and abundant living are such a mindset, a choice. When I start sinking into scarcity, I have to remember that’s just one of the devil’s tricks to make me think that Lord doesn’t love or provide enough for me. Prayers for a day of abundant blessings! Amen, praying the same over you right now, Alice. Abundant blessing and grace. Betsy, so very true. Some of the most memorable times have been around a table eating leftovers – of which there was always enough. Amazing how our God always provides, always has more than enough. Definitely want to keep thinking on this today. Blessings! Yes, we have a joke at our house when we have leftovers: “There’s PLENTY!” Said when it’s odds and ends of bits of food! 🙂 Last year I actually invited a friend for three day old Thanksgiving leftovers, and it was a feast! This post made me giggle as I remembered a couple of times my perfectly planned dinner was disastrous! At least in my mind. I think the people we invite into our homes are probably just thankful for an invitation. Yes, we are abundantly blessed in God. Yes, Patricia, I’ve had more than my share of bloopers, for sure! They make great memories. That’s a priceless reminder, and your daughter is wise beyond her years. I think I need that message somewhere visible in my kitchen! I’m there with you. I made my entire family sick, not realizing the chicken wasn’t completely cooked. I looked done. . . Laying down the scarcity myth to rest. Ooh, I never thought about the possibility of making everyone sick! Oh my word. I need to let God transform my mindset to one of abundance. 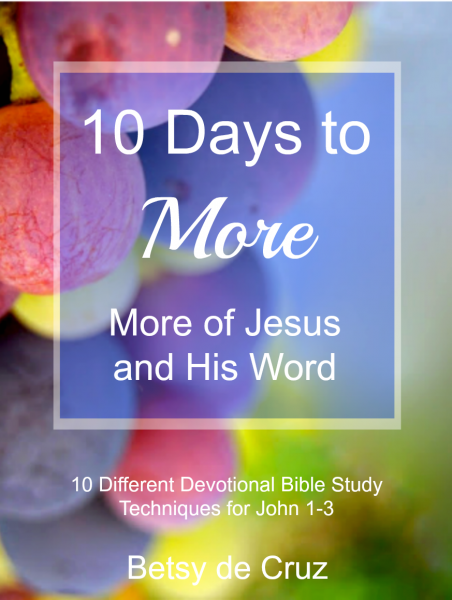 Recently I wrote in my journal, “Why do I think God will hold back on me when I know He gave all He had in Jesus? Thank you for this reminder. Amen, Debbie! That’s straight out of Romans 8, my favorite chapter in the Bible! Great piece. I’ll have to remember that one about being free to love others because Jesus loves me and not loving others hoping they will love me back in return. Yes, Kathleen! That’s a hard one to remember (and actually live out!) sometimes. And let’s hear it for those kind of friends who bring flowers and grace and could care less that they didn’t eat half a bird for dinner. Yes, we are, Linda. I sent my friend the link to this post because I thought she’d laugh about it too. Yes He is good! So good to give us what we truly need. “I have enough time to do what He calls me to do today.” God, give me the wisdom and discernment to know just what it is you’re calling me to for thee 24 hours you’ve given me. Lots of goodness here, friend! Thanks for the encouragement to get my day going! Yes to that prayer, Liz. I need that same wisdom and discernment. Not always easy to know, is it? 🙂 Blessings on you, friend. Thanks for the encouragement, Julie. I appreciate you. Yes, my daughter often points me in the right direction! Betsy, God is speaking to my heart through you today. This is an area where the enemy has wreaked havoc and still tries to. Thank you for sharing! I love you and appreciate you! Praying for you now, Desiree, for open eyes, and for God to bless you abundantly with all the provision you need. In every area. Yes! I totally understand that feeling of not enough! Just this morning I was jotting notes down for a blog post about this! Would it be ok if I include a link to this post in mine (when I get it written…)? Such excellent points, Betsy! I’ve also served undercooked food to guests before (half-baked biscuits are yucky!) But your daughter’s words are right on- rarely are people there for the food. So thankful God is enough and gives enough for us to love and serve and live to His glory! Half-baked biscuits! You’re making me smile! My biscuits turn out like hockey pucks. (No one in our family makes them like my Aunt Beulah.) But I bet people love sitting around your table anyway, Bethany! This is a beautiful reminder! God has supplied for us and thankfulness changes everything! Plus you were able to enjoy fellowship whether it looked the way you wanted it to or not. Love your perspective! I regularly say “I’m running late today” or “I’m behind on my schedule.” But what a powerful shift, Betsy, if instead I said: I’m simply learning to follow God’s timeline for me. Smart girl you’ve raised, sweet friend! It IS a powerful shift, Crystal, and one I’m trying to learn to make. I keep telling myself often, “I’m not in a hurry.” For me, the hardest thing is waiting on others when I’m ready to leave the house, but I just try to say, “We’re not in a hurry.” It helps somehow. Your daughter is a wise young woman, Betsy :). I lived with a scarcity mindset through most of my life. Learning about God’s abundance was truly a game changer for me. 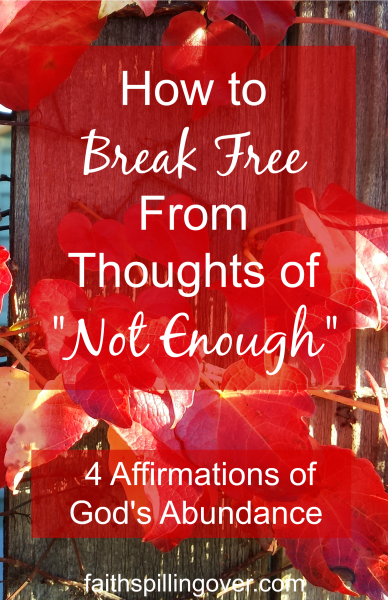 I LOVE your 4 affirmations. They cover so many important areas. Thank you! 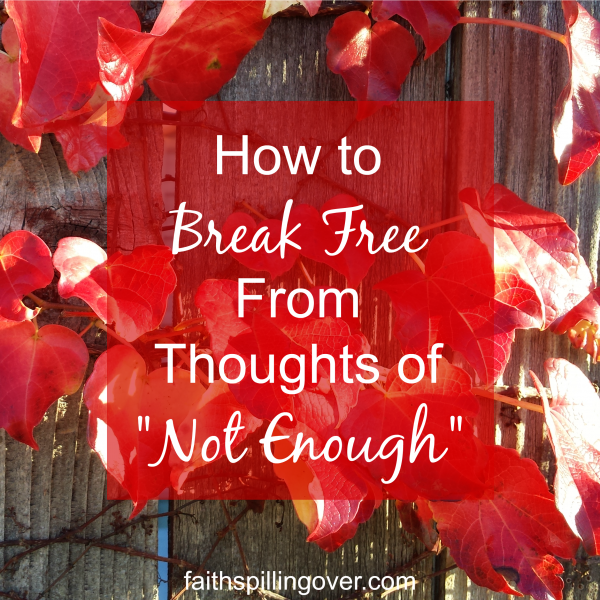 I agree, it is far too easily to fall into that scarcity mindset and worry that we are not enough. Also to get caught up in worrying about things that are not really the most important. Thanks for this reminder of God’s abundant provision. Yes, Lesley, I can start worrying about itty bitty stuff! I’m trying to learn to relax and trust God more. This reminder is very timely in a season of feeling less than. It is a great encouragement for us to stop with the scarcity mindset and focus on what we have been given. I used to feel so crowded in our little house, but when I started really being thankful for the coziness of it, I began to love it. And the truth is, it doesn’t [usually] feel so crowded anymore. Oh I’m glad you love your little house, Sabrina. I live in an apartment in the Middle East, (with barely any storage space. We’re talking WARDROBES instead of closets 🙂 ) And yes, I could have written a whole post about that alone! I’m grateful for our home too. And I do love it. I wonder if men struggle with the not enough mentality the way we women do? I suppose Paul did, when he wrote about his thorn in the flesh; otherwise he wouldn’t have been able to go on to write about how God’s strength is made perfect in weakness. Thanks for this post, Betsy; I always love the lessons you draw (and share) from everyday foibles. Very relatable! Thank you Jeannie. I do notice my husband doesn’t seem to gripe about stuff as much as I do. 🙂 But I do think they probably have a “not enough” mentality over other things, maybe? This is such a wonderful reminder. I love how your daughter spoke words of encouragement to you! Also, the affirmations are such a good practical way to see that God gives us everything we need. Yes, it really helps me sometimes just to preach truth to myself. Declare it, say it, and think it! Oh how I replay the disasters in my head – thinking if only I had…… or if I’d thought of ………. Thank you for the reminder that in those times we need to rehearse God’s truth about us rather than focus on our inevitable human foul ups. Right now I am 12 hours from home. Sick as a dog in a hotel room praying for enough grace and strength to make it through a family wedding today. I know His grace is sufficient. Your reminder was perfect timing. Oh Bev, I’m just seeing your message now. I was away from my computer a few days. I wonder how everything turned out? Great reminder to focus on all we do have, and that he gives us enough. Perfect article for this time period. I hope you had a good Thanksgiving, Theresa. They didn’t come for the chicken. Out of the mouths of babes! I have to remind myself of those kinds of truths, too. You’re right; God always gives enough—of everything we need. It’s a foundational truth that I still struggle to believe in everyday life. Thanks for sharing this story, Betsy. I told myself the same thing yesterday when my turkey breast was a bit, ehem, DRY! They didn’t come for the turkey! This was so inspiring. Grateful each day to the Lord for His word…so encouraging and nurturing… bringing fresh life into each day spent on earth!! Yes, His Word encourages and feeds us!